The ocean calls to most of us. We either live near it or wish we did. Many of our favorite memories include a beach somewhere, with warm sand, a gentle breeze, seashells, and the roar of the tide that rolls continuously onto the beach. Surfing and swimming in the salty water, watching for dolphins and whales to fly out of the water. Perhaps you picture a winter beach in a storm with waves crashing on the rocky shore. However you see it, sea life is another gift idea that crosses generations and genders. Remember the shells you would collect? The starfish and sand dollars? The colorful stones smoothed by the constant motion of the water. Coral, seahorses, tidal pools. Just a few of the subjects of home decor, artwork, fabrics and jewelry. Often one shade of blue takes you there in your mind. You will find a lovely variety of items here to remind you of the ocean. Clothing, jewelry, decor, even handmade beach blankets and hammocks. All of the handmade treasures are made by master artisans, worldwide, and brought to you in association with National Geographic. A hammock is definitely a part of sea life, though out of the water, rather than from its depths. Still the brightly colored patterns, the pure relaxation one feels when considering one, brings to mind a sunny day at the beach. 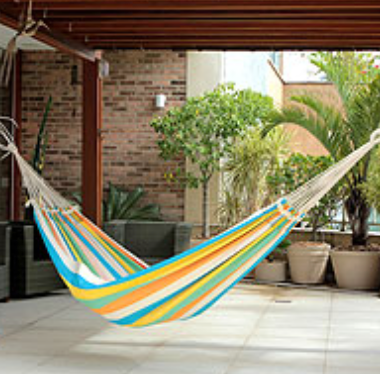 The hammock pictured here is a delightful example from the Hammock Artisans of Ceara, Brazil. There are many to choose from, but I thought this one looked like the beach, with the blues and bright colors you find there. The hammock here is 100% cotton, and will hold up to 240 pounds. The techniques used in creating and decorating the hammocks have been passed down from mother and grandmothers. It is a traditional the people of Brazil have hoped to continue with their daughters, though interest in learning the methods has been waning with the draw of today’s world. Still, as the girls see the demand increase for quality hammocks, they are coming back to their tradition. It sounds like a wonderful idea to find special and unique gifts here, while knowing you are helping artisans across the globe develop a sustainable income for themselves and their families. You can see over 100 gift ideas here.